So, you’re headed out to the golf course ready to take on “Old Man Par” (look up and read Bobby Jones biographer O.B. Keeler) or in my case lately, “The Joy of Six”. You probably got going a little late, driving fast to the golf course, clubs in the trunk (just thrown in having sat in the garage or basement for a few months or years), and thoughts of how much money you plan to take off your buddies are dancing in your head. You may also be wondering if your golf bag has any balls, tees, usable gloves, a divot tool, and I might need a band-aid or some tape. Now you wonder if you have anything in your golf bag. Pull over buddy, that’s distracted driving. First of all, what kind of golf bag do you own? Is it a carry bag with stand? Did you splurge and get a staff bag (think Al Czervik from Caddyshack)? If you plan to walk and carry your bag, then weight is an important factor. If you’re using a pull cart or power cart, then it’s a matter of toting your bag to the pull cart or power cart area. To start, let’s say you have a double-strap carry bag with stand. Golf balls. At least two sleeves up to a dozen balls. Remember, golf balls add up in weight. Before or after you play, dump out the balls you know you won’t use. Tees. You can never have too many tees in your bag. Wood tees are still the least expensive, but the newer plastic tees are becoming more and more durable. Make sure you’ve spoken with your 2nd Swing club fitter and know the correct height you should tee the ball for optimal distance and carry. Gloves. Have one glove already in use, a new one as a back-up, and I would recommend a set of rain gloves. The FootJoy rain gloves are still the best bet. I’ve played in torrential downpours wearing the gloves and the club will not slip from your hand. Sunscreen. Minimum SPF factor of 30. Skin Cancer is becoming more and more prevalent and golfers are one of the leading candidates. You are going to be in the sun for the next 4 hours, so do the right thing. Besides, a golfers farmer tan is not that cool (one tan hand, tan arms up to your elbow, tan legs from ankle to knee, and a solid V-shaped tan on your chest from wearing your polo unbuttoned…wait, that’s what I look like). Ball marker. Keep some coins in your bag. Most bags now come with a velvet or soft area for storing your watch, wallet, phone (turned off, right), and car keys. Or use your favorite golf course marker. Still trying to understand why everyone is using a poker chip as a marker. Divot repair tool. EVERYONE should not only have a divot repair tool, but also know how to properly use it to repair greens. Don’t know the correct way? Ask your pro or superintendant. Fix your ball mark and at least two others. If everyone followed that simple suggestion, think about how nice the greens will be over the course of a golf season. Band-aids, tape, super glue. I get a lot of “huhs?” when I mention super glue. 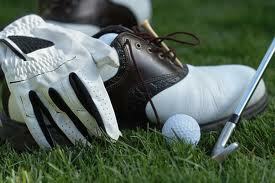 The band-aids and tape work for your blisters, but anyone who golfs has had skin separate from their fingernails. It’s painful and bleeds, so having some quick drying adhesive is helpful. Super Glue is standard but New Skin or Dermabond work as well. Food and water. Granola bars, bananas, a freshly made sandwich. And water. Keep hydrated during your round. We’re all guilty of wolfing down a hot dog and a beer at the turn or hitting on the beverage cart gal for a discount on that Bloody Mary. Fine, but keep drinking water and nibbling on snacks. It keeps your energy up and your body hydrated. Me? I play best on a two-beer buzz, but I’m still drinking water and snacking. Umbrella. If it looks like rain, then pack it. Especially if you’re walking. Rain Suit. A water-proof rain jacket protects you from the downpour and allows you to keep playing. Same with rain pants. If the weather starts out a little shaky, then wear the pants and take them off later. Extra towel. Not the big towel sticking out of your bag, but a smaller one you can keep dry to wipe down grips, if needed. Extra spikes and spike wrench. Having a couple of spikes handy is always nice when you have a blow out. Sharpie pen. Putting your stamp on a golf ball identifies it as your ball. Everyone can play their Titleist ProV1 #1 ball if your initials or dots are on the ball. Rules of Golf. For the sticklers and big money games. The rules can help, if you know how to use the rules to your advantage. Unlike Al Czervik (seriously, if you don’t know who he is then we need to start you all over with golf), you don’t need the portable TV, beer tap (hmmm), club launcher, and radio to stock your bag properly. What did I miss? What’s in your bag that you must have?